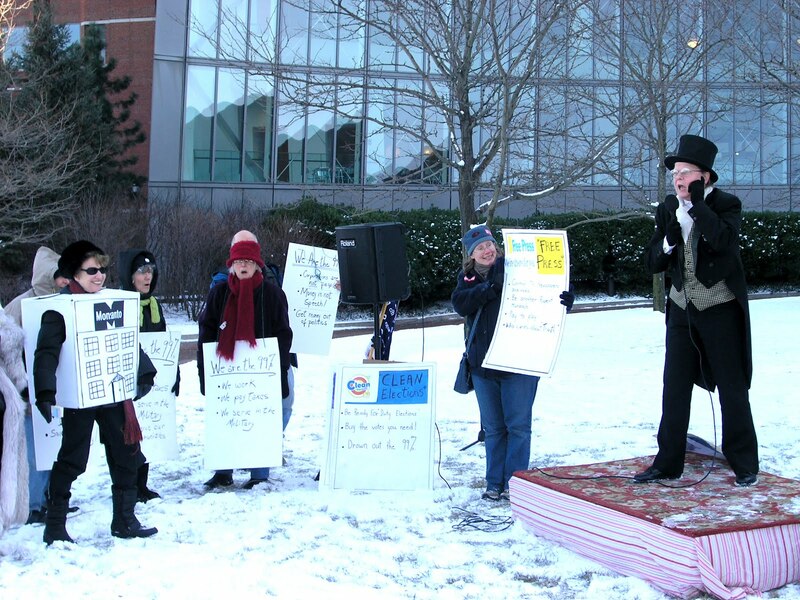 In Boston, Occupy the Courts inspired more than 200 people to come down to the waterfront and rally at the Joseph J. Moakley Courthouse. 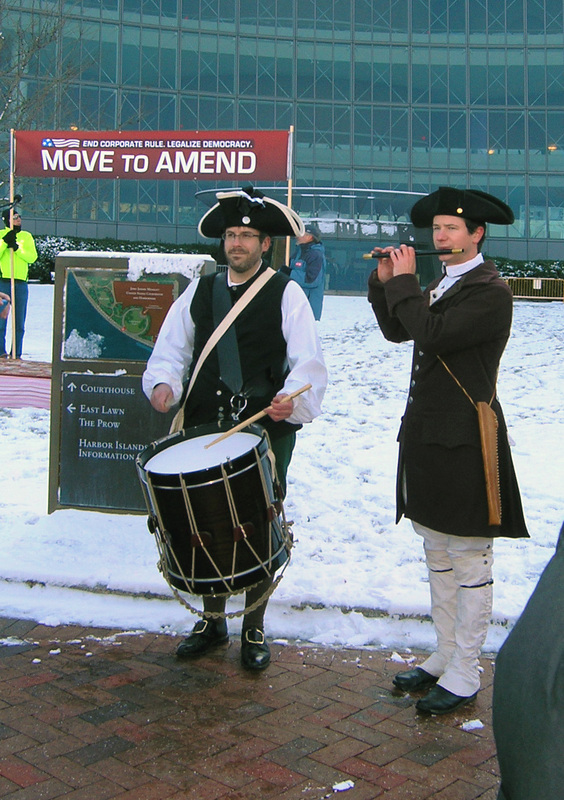 After a fife and drum fanfare, they heard from AfD member and Greater Boston Move to Amend affiliate coordinator John Hill, state Representative Cory Atkins, and Pam Wilmot of Common Cause. Rounding out the rally, a skit in which a certain famous monopolist auctioned off free speech, the White House, the 2012 elections and Congress to a bunch of eager corporations until the ignored 99% took charge and put him under citizens arrest. North Bridge chapter members brought three carloads of demonstrators and volunteers from the greater Concord area, where they were joined by folks from the north and south shores as well as Cape Cod. 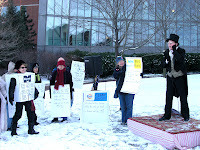 The rally was co-sponsored by several local organizations including Alliance for Democracy, Clean Water Action of Massachusetts, Coffee Party USA, Common Cause Massachusetts, Community Labor United, Corporate Accountability International, Greater Boston Coffee Party, The LEAH Advocacy Group, Massachusetts Senior Action, MassVOTE, Progressive Democrats of America, and the Unitarian Universalist Congregation in Andover. Occupy Boston stood in solidarity with us, and Operation Woof, the canine contingent of Occupy Boston, also turned out to remind us that if we need to know what human is, we should ask a dog. Video of the event isn't online, but the local Univision affiliate provided some good coverage here. You can see some pictures of the event here. After the rally both AfD and Move to Amend supporters participated in a two-day Occupy Boston "Rally and Summit to Unite Citizens for Democracy," featuring panel discussions, trainings and presentations, and a reprise of the auction skit. We'll be following up with new contacts at a meeting on February 2, at 7 p.m. at the Cambridge YWCA--for more information, please email bostonmta@gmail.com.